With rivers and lakes filled to the brim and more rain in the forecast, emergency officials in Texas on Friday braced for more of the flooding that has severely damaged or destroyed 1,000 homes. State emergency management chief Jack Colley said all of Texas' major river basins are at flood stage, the first time that has happened since 1957. Major flooding was forecast on the Guadalupe River in Victoria and Calhoun counties, where it was expected to crest near Bloomington at just over 27 feet early Saturday. Flood stage is 20 feet. "Mostly this time of year we're fighting wildfires ... The problem with this is, the water won't go away," he said Thursday. Other areas of concern include the Brazos, Sabine and Trinity rivers and Nueces River near Corpus Christi, Colley said. Colley said the state has already mobilized its largest ever flood response efforts of search and rescue teams and aid for flood damaged areas, reported CBS affiliate CBS 11 in Dallas/Forth Worth. Floodwaters slowly subsided Thursday in parts of Oklahoma and Kansas. Concerns eased that a full Lake Texoma along the Oklahoma-Texas line would send floodwaters into the Red River. The U.S. Army Corps of Engineers said water could spill over the Denison Dam on Friday, flooding areas to the south. Those living in farm areas near the river were told to move their belongings to higher ground and have an evacuation plan. Early Friday, Lake Texoma's level topped 639 feet, well past its normal elevation of 619 feet and just shy of the top of the spillway — 640 feet, according to the Corps. "It's still rising but right now, we've been able to handle the flows and minimize the threat for downstream flooding," said Ed Rossman, assistant chief of planning for the Corps. To the south, storms that began May 23 continued pounding Texas. The National Weather Service said 1 to 3 inches of rain could fall Friday, with heavier amounts in isolated areas. On Thursday night, rainfall amounts in the past 24 hours included 5 inches in coastal Palacios, 2.2 inches at Houston's Hobby Airport and 1.9 inches in Rockport. Flash flood warnings were issued overnight for several counties in northern Texas. Flooding washed out a bridge in Anderson County early Friday and authorities closed at least two roads, a dispatcher said. Hunt County also reported road closures. Michael Gittinger, a meteorologist with the National Weather Service, said a series of low-pressure systems that have hovered over Texas for three weeks, combined with moist bands of air from the Gulf of Mexico, have fueled the near-record rainfall. The system is forecast to move northward through Arkansas and toward the East Coast. The affected area covers 49 counties and 48,000 square miles from northern Texas to the Rio Grande Valley, a section roughly the size of Greece. Thirteen deaths have been blamed on the weather in the past 2½ weeks in the state, Gov. Rick Perry's office said. The latest death occurred early Thursday near Clifton in Bosque County, when a car driven by a 37-year-old woman hydroplaned, collided with a curb and plunged into a creek, authorities said. Four people have been reported missing, including a 6-year-old boy swept into the Gulf of Mexico on Tuesday as strong currents ripped him from his father's arms at the mouth of the Brazos River in Freeport. In Missouri, the body of a 16-year-old girl was found Wednesday night in a submerged SUV after she apparently tried to cross a flooded creek. So far, the heaviest flood damage has been in Miami, Oklahoma, where the Neosho River crested at about 29 feet, its highest stage since 1951. The river was not expected to be back within its banks until late Sunday. About 600 homes and businesses were believed damaged, City Manager Mike Spurgeon said. More than 30 area roads were still closed Thursday. Spurgeon estimated it could take six months to a year to rebuild in the parts of town most heavily damaged. Displaced residents watched and waited, anxious to begin salvaging soggy belongings. Dorena Jackson walked near her neighborhood in Miami, Oklahoma, trying to get a glimpse of the home she left two days ago. "I don't even have a change of clothes," Jackson said. "I lost everything as far as I know." 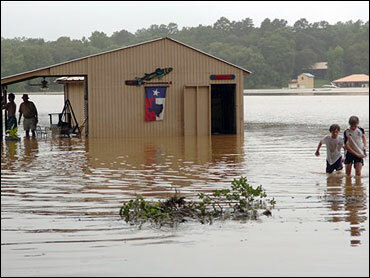 President Bush has issued federal disaster declarations for numerous counties in Texas, Kansas and Oklahoma, clearing the way for housing assistance and low-interest loans, and more declarations are expected.